Texas Instruments introduced with the TI-30Xa SE a more robust version of the original TI-30Xa Solar for school purposes. Compared to the standard calculator this "School Edition" uses tamper proofed molded keys instead of the rubber keys and an extra window above the display and solar cells. Everything else is identical to the standard calculator. Dismantling this TI-30Xa SE manufactured in 1996 by Nam Tai Electronics, Inc. reveals an unusual construction with a mix of two different printed circuit board (PCB) technologies. A relatively cheap, phenol type PCB was selected for the keyboard while the single-chip calculator circuit was bonded in chip-on-board technology direct on a epoxy style PCB. Even 10 years later Nam Tai still preferred this technology, don't miss a later TI-30X IIS. This calculator got later a new styling like the TI-32 Explorer Plus. View it here. In 2005 Texas Instruments failed with the TI-30Xa Solar School Edition for Virginia and recalled about 160,000 calculators. 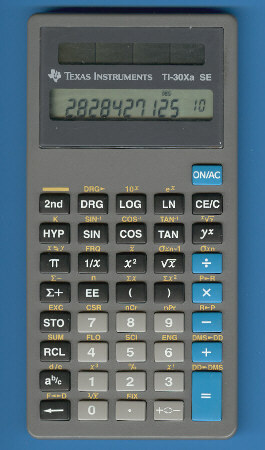 The extension "School Edition" wasn't limited to calculators, in 1987 an electronic toy found its way into the classrooms. Don't miss the wonderful Touch & Discover School Edition. Stokes Publishing Company, Inc. based in Sunnyvale, California sold a companion for the teacher, view the wonderful Scientific Plus.